Dr S M Tadkodkar, will be penning a few articles for the 'SaveMyLanguage' project. The articles pertain to the Konkani language & the Konkani People. He is an author of 18 books (5 of them in Konkani) and is a recipient of many awards. He is 55 years old and has been working as an university teacher in Goa University since 1994. While his forte is poetry, his passion is research in the area of 17th century Konkani and Marathi literature. He uses the pseudonym Su. Ma. Tadkod while contributing to literary writing in Konkani & Marathi. 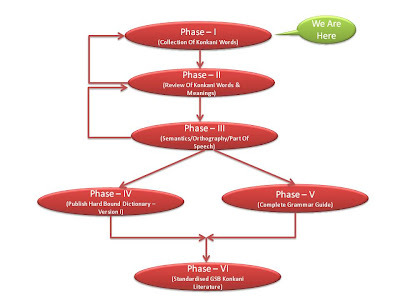 Details the various phases of the project and where we are at presently.